If you’re an experienced personal trainer, fitness or movement professional, the chances are you chose your profession because you love the buzz of helping your clients maximize their potential. But it is important to stay ahead of the game by constantly expanding your knowledge by learning new skills, if you don’t your competition will, leaving you playing catch up. So don’t get left behind, with Unity Body MOT you can build your existing skills – not simply the latest fitness fads or equipment but in the very latest information and skills to help you and your clients be more successful. 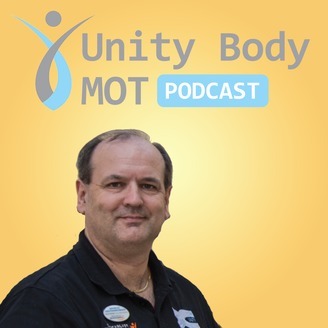 CHRIS: Hi there and welcome to the Unity Body MOT podcast. 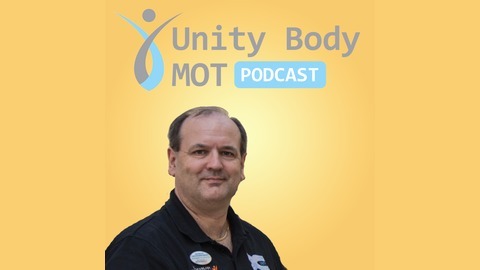 Welcome to show 2 of the Unity Body MOT podcast with Simon Wellstead. CHRIS: Hello, and me Chris Dabbs. This week’s podcast is going to be slightly different to last week’s podcast where we discussed how the Unity Body MOT system can help fitness professionals and other people working within the fitness industry to really help their clients make sure that any exercise that their doing is the best thing for them. Now Simon, I understand this weekend you’ve been pretty busy with talking to potential new clients and other people with the fitness industry, is that right? SIMON: Yes, it’s been a fascinating weekend Chris. It was a three day seminar with my business coach who specializes in fitness and exercise and health professionals. And I was there in the capacity of having an exhibition stand and talking to probably about 250 people over the weekend, it was a really massive experience for me listening to fit pros and exercise pros, listening to what they do, how they work with their clients and enabling me to help them understand how we could help them serve their clients in a bigger way. CHRIS: Oh wow! So basically you were talking to people about how Unity Body MOT can help their business, and I guess in turn, help their clients – is that right? SIMON: Yes, absolutely. It’s all, at the end of the day, about them helping their clients in a bigger way so their clients feel as though they’re being served better and say, “Wow, that guy is great” or “That girl’s great, go and use them.” That’s essentially what I was doing so it was a really enlightening experience for me working and talking to so many great people in the fitness industry and enabling me to understand their needs in a better way. CHRIS: Okay, well it’d be great to actually talk about what happened at the conference to really understand how people saw how your system could help them to be able to grow their business and help their clients. So what was the main question that people asked you? SIMON: It’s a really interesting question Chris. The questions were not particularly specific because people don’t know what they don’t know. And what we teach and present and coach fitness pros in is very new to them. So the first question that I generally got was, “Simon, I love the introduction that got done for you and I’ve been watching your video that you’ve got on there and I understand you’ve got a free CD to take away, but actually, what is it you do? Can you explain it to me in my context of my business?” So we’d then start by talking to them about what they did, understanding their clients. So it was a reverse questioning situation that I went through because everybody I work with works differently, they have different clients, those clients have different needs. So it’s not a case of one size fits all, which is actually a phrase I use a lot. CHRIS: If it’s not a case of one size fits all then does that mean that people who work in a specific part of the fitness industry, in other words maybe a personal trainer rather than a fitness professional or any of person within the industry, would benefit more from the Unity Body MOT system? Or do you think it benefits everybody equally just in different ways? SIMON: The latter definitely Chris, it benefits everybody but in different ways because, as I said, they all have different clients with different needs and everybody’s training is slightly different. So a personal trainer will have a slightly different training to a Pilate’s instructor to a sports coach to a running coach or somebody who does group exercises at gyms which is mat based in a studio. They will have different requirements/different needs and the important thing is to realize that once you understand that client better you can give them a better service. You can advise them more effectively and ultimately, hopefully, the goal of this is that the client gets their objectives achieved in a quicker time or more successfully or more safely or whatever it is they want to do. CHRIS: I see, so let’s rewind a little bit there then, let’s try and narrow this down to a specific type of trainer or fitness pro. So let’s have a look at a Pilate’s instructor; how would a Pilate’s instructor be able to use the Unity Body MOT system to deliver a greater range of benefits to their clients? Is it as simple as that – by using the system? Can that actually happen or is it complementary to Pilate’s? SIMON: Totally complementary, I know never step over the line and say I’m doing training or a course specifically for Pilate’s people, I love delivering what I do to a mixture of people. Having said that, a Pilate’s instructor is specifically taught to help improve people’s posture, help them move better, and if they’re working in a therapy context, help them get out of pain if they’ve got back pain – which is very different to a personal trainer who is there to perhaps deliver performance improvement, weight loss, increase somebody’s stamina if they’re training for something or just generally be fitter. So there is a difference and once a Pilate’s instructor understands the information that we present, they understand that need to have good posture, need to move more flexibly, need to move more smoothly in a different way. They’ve got a toolkit of extra knowledge, so if they see somebody struggling and is clearly not responding to an exercise series that is being given to them in the way that the Pilate’s instructor would hope, maybe they could go to their bag of tools and say, “Okay, let’s look at this in a little greater detail. I’ll take a different tool out of my case and work out why what is happening is happening” and therefore give them more understanding so that the client doesn’t get frustrated that things are not working for them. I ran a course in Hertfordshire back end of 2015 and I think I had 3 Pilate’s instructors on that particular course. There were personal trainers and other fitness professional there as well. And we teach them some tools, including a slightly different exercise model that they can employ with their clients, and the feedback I got the next morning was that two of the Pilate’s instructors had taken that exercise model and actually delivered it to their clients that very morning. And the response was that the clients felt much better after it and they were then able to do the other exercises that the Pilate’s instructor was trying to get them to do more effectively. It felt more easy, they were able to get into positions perhaps from a postural point of view or move better. So the Pilate’s instructors had taken what we’d instructed them in, taken the new exercise model and ideas that we’d presented, given them straight away to their clients – which was absolutely fantastic – and had reported back instant benefit. CHRIS: Wow, so what you’re saying is that the Unity Body MOT system gives somebody knowledge that they can use immediately and really get results for their clients immediately. It’s that quick? CHRIS: Because they’re struggling or…? CHRIS: It enables them to really think about how some of the information you’ve given them enables them to do something different for their clients so quickly that the client – it’s probably imperceptible to them – it’s so smooth and such a transition. SIMON: Absolutely, that’s a great description. CHRIS: Right, oh wow. So okay, for Pilate’s instructors it’s allowing them to step back and have an overall view of what is happening. And to be able to change their advice to their clients in a way that would benefit them much more quickly. And what about sports coaches and things like that? How would it apply to them? How can they benefit their clients? Is it equally as quick? SIMON: it’s really great that you picked up on sports coaching because I did run some coaching up in Sheffield a few weeks ago and we had two sports coaches actually present. One was a running coach and one was actually a coach for the Great Britain climbing team. I didn’t understand that Great Britain had a climbing team but hey. CHRIS: We do have a team, but that’s fantastic though isn’t it, that we have a team climbers? Brilliant! SIMON: We do, and obviously from a sports coaching perspective, they are more interested in improving performance, improving technique and trying to get them to be able to run better, run faster, run longer, or in the case of climbing which I learned a lot about over the weekend, to help them climb faster – it’s all clock based climbing that they do so they have to basically get from A to B but it’s vertical. CHRIS: Who would have thought? SIMON: And we had some really great discussions because the tools that I present in training are just as equally valid for improving taking somebody up from performance level A to performance level B in whatever they do. So I’ve got colleagues and friends of mine who work in the same area and work with tennis player or work with golf players. And obviously we’ve talked about running and climbing, it is a very big area but it is all performance based. And they’ve got a greater understanding now about their client’s body so if they’re seeing, in the case of the running coach, that somebody is running in a particular way and struggling to get over some kind of threshold that they’re trying to deliver against, whether that be speed or whatever it might be, they can now take a step back and say, “Ah okay, hang on, maybe this is happening so I’ve now got a toolset of tests I can do that will tell me whether something different is happening.” But before the training they would have never known that something different could have been happening or was happening. CHRIS: So you’re really enabling these coaches and fit pros to know more than they didn’t know, if that makes any sense. So in other words, really they didn’t understand precisely how they could help somebody or know what the problems were that somebody had. And just through the initial phases of the Unity Body MOT program, you are actually them to help their clients to make those tiny incremental changes that make all the difference. And I suppose a few very physical types of sports including, as you say, the climbing team for GB – who would have thought that we were a) any good at that, b) actually in it in the first place and c) that yes, every single part of the body has to work in such a way as to be able to literally claw back every single millisecond of climbing a vertical face I guess? CHRIS: That’s incredible! So for the climbing team, let’s have a look and try and understand exactly how you helped their trainers and their coaches to help the climbers themselves. Is there something specific you can share with us on that? SIMON: Yes, I mean I’m not a climbing expert, but I had these discussions with the gentleman who was on the course and we were talking about the fact that when you’re climbing you’ve got to have a massive amount of coordination and strength between the fingers that are obviously gripping a particular place and the lower body which is going to help you move up to the next point on your war. CHRIS: Pushes I guess, isn’t it? SIMON: Absolutely, and that is coordination but it’s also strength. So the tools we were delivering would give a different dimension as to why they might be struggling to get from A to B in a particular way given a particular obstacle on a particular wall. They might have a problem with their foot, there may be an issue with their pelvis, there may be an issue their nervous system which is not allowing them to have the flexibility, strength and mobility to deliver that type of movement in that particular situation. SIMON: I think they call those an overhang. CHRIS: Oh, so overhang. Oh so the overhang, and then they have to kind of flick themselves over. And that sort of maneuver, I guess, really does need to be trained for – it’s not just something you come across and just do through innate skill I guess. How would Unity Body MOT help that particular climber to train for that? I mean are you talking about being able to weed out the people who aren’t able to do that particular maneuver or helping people who find that particularly difficult to make it easier for them to then do that maneuver – if you see what I mean? SIMON: Certainly the latter, it’s finding out what in the body is blocking or providing a blockage for them to do something that they need to do that they can do and that they maybe can be able to do well. But this is all about fractions here, so we’re saying taking them from A to B but that’s actually taking where A is already pretty damn good – they may be completion climbers, or completion runners or competition tennis people – but it’s basically finding that next level. And there may be something within the body, which is maybe not visible to the human eye, which is inhibiting them being able to make that step in terms of additional performance. CHRIS: Yes, so we’re looking at the physicality again here rather than the mental state of any training or any sports person. That’s fascinating really. Okay let’s try and not talk too much about the elite athletes and let’s go back down to basics and really look at, say me, because I’m basic believe me; but me in a gym situation with a personal trainer. Is there a way for a personal trainer to sort of identify that knee issue without me knowing that it actually exists? I mean can they spot it because of my gait for instance? Is that something that the system trains them for? SIMON: Yes absolutely and that’s a really interesting example. We now know that well over 90% of knee problems have got nothing to do with the knee, but what it has got to do with is something that is actually not visible to a personal trainer or anybody really. CHRIS: That sounds strange, how does that work then? SIMON: Well the vast majority of knee problems come from your pelvis not working properly. CHRIS: So what, are you saying it’s referred pain from the pelvis or just because it’s just putting somebody out of kilter? SIMON: It’s not a referred pain because referred pain is where you have pain in place A and pain in place B. What we’re saying is somebody may, after exercise, report some pain in their knee. But that actually could be to do with something not working in the pelvis and there actually isn’t any pain or any symptoms in the pelvis at all. We’re just talking about, “Does the pelvis do its job properly?” Is the pelvis doing its job properly and that’s one of the things we train personal trainers to pick up on because a lot of body functions in exercise and performance are obviously managed the pelvis. It’s in the center of the body, pelvis means basin – it’s the bucket of the body – it’s where everything from the top comes down to the pelvis and everything from the foot upwards comes into the pelvis. So it’s not surprising that a lot of issues stem from the pelvis. But it’s not just a case of looking at the pelvis and saying, “Oh it’s tilted or it’s not doing this or it’s not doing that from a visual point of view.” We actually teach the personal trainers to work out precisely how is or is not working. And then that’s going to deliver a lot of information about somebody’s pain in their knee or pain in their foot or lower back problems or shoulder problems. So the knee is a really good example, we now know that the vast majority of knee problems don’t stem from anything actually happening in the knee, they stem from something else in the body not working properly. CHRIS: Okay, so I kind of understand that really the podcast isn’t the place to give real instructions on how to overcome any particular knee problem per say. But I guess that actually makes a lot of sense because the Unity Body MOT program is about enabling the personal trainer to look – I guess it’s the old phrase – look outside of the box rather than looking at the knee and saying, “Oh yes you’ve got a problem with your knee, you can’t do this exercise or that exercise.” But what you are enabling people with is the tool and the power to step back and to really assess a client’s situation, would that be about right? SIMON: Yes, that’s brilliantly put actually Chris. We’re about changing a mindset and being able to, you use the phrase ‘take a step back’, and use some strategic thinking which will be new to the vast majority of fitness professionals. CHRIS: Oh yes, and foreign as well I would have thought. Another classic example is tight muscles, who hasn’t got tight muscles? But the way that most fit pros will address that is to actually see that muscle X is tight, let’s pick one – hamstring – it’s one that is commonly very tight in lots of people. The intervention for that would be most typically to introduce warm ups or components of the exercise regime which try to stretch that hamstring to reduce the tightness. Unfortunately, we now understand that there are several different types of tightness and stretching, quite often, is not the answer. But we teach the personal trainer to take a step back and say, “Okay, I can see that there’s tightness there in the hamstrings. Let me work out (using the tools we teach) what type of tightness it is. And therefore, I can then build an exercise program which matches exactly what’s going on in your body.” The net result, we hope, will be less tightness in the hamstrings; but not just by pulling the ends of the hamstrings to make them longer because they’re tight and therefore we’ll stretch them. It’s using a somewhat more strategic approach to say, “Okay, so I know that there are three of four ways that a hamstring can become tight, which one is applicable to you Mr. Client/Lady Client? Okay, I now understand why your hamstrings are tight, now we can move on. CHRIS: Yes from a lay person’s point of view I guess as with anything, even in my industry everything moves forward at a very fast rate, and really your Unity Body MOT system is really like continuing personal development for fit pros really. To make sure that they’re augmenting their own original training that they’ve been through – sweated through – to qualify and get to be able to do everything that they want to do for their clients. And so yes, Unity Body MOT helping in that way by allowing them to step back can only be a great thing for clients. SIMON: Yes, and I think that’s a key point. I mean I’m a trained sports therapists and I learned this information which I now train people in was something I learned, I didn’t learn it in sports therapy training, it was just through circumstances and the people that were coming to me and the sort of people that I met and got involved with and was talking to – peers in the industry – that said, “Actually Simon, the sort of things you’re talking about can be dealt with now through this additional training.” So I learned this stuff through additional training. I’m now basically paying that back to people and saying, “I’d like to do the same for you.” I benefited from it, I was able to help clients in a bigger way by taking a step back and questioning what I’m seeing, what the client is telling me to enable to then move forward. It’s a case of taking one step back to take two or three steps forward. CHRIS: Well exactly, as opposed to just running into it like a bull at a china shop kind of thing and just doing the first thing that comes to mind. Stand back, consider and then action really, I think that’s that. Okay fascinating, absolutely fascinating trying to understand how personal trainers and fitness professionals can help their clients just by stepping back for a few minutes, it’s incredible. Okay, well let’s go back to the conference that you attended this weekend and you were exhibiting at. You spoke to lots of people I bet, how many people were there, 250 did you say? SIMON: Something around that figure, yes. CHRIS: So you had 200/250 people who are all in the fitness industry, and you must have spoken to a whole bunch of those people, and what sort of things were people asking you? What were the sort of the main issues I guess with how they felt was how the Unity Body MOT program could help them? SIMON: Okay, so generally speaking the conversation would start by them not fully understanding what it was that I was doing. So they were coming at it from the point of view of they don’t know what they don’t know, which is great. But then I would generally turn the question round to ask them who they typically worked with – we use the phrase ‘ideal client’ – who are the people that they go to to get on the marketing? Who are they looking to work with most? And then understanding typically what those ideal clients are coming to that personal trainer or that fitness professional with, then we can start saying, “Well okay, so what typical strategies do you currently employ with those clients and are you hitting any brick walls?